Camp for €14,- a night at Campsite La Lénotte in low season with CampingCard ACSI. 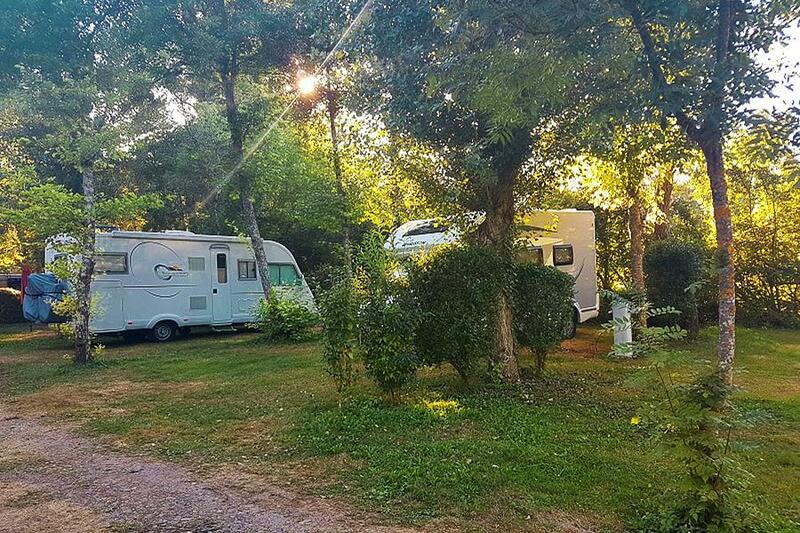 Campsite La Lénotte, located in Monplaisant (Dordogne), is a campsite with 33 touring pitches. With your CampingCard ACSI you can camp on one of the pitches during the following periods: 01-04-2019 - 06-07-2019 and 25-08-2019 - 30-09-2019. At this campsite you can not only use your CampingCard ACSI for inexpensive camping, you can also use your ACSI Club ID (as an alternative ID). A spacious, peaceful campsite where you will be welcomed by young, enthusiastic owners. A lovely brook meanders through the campsite, suitable for fishing. The Dordogne, Sarlat and fortified towns are nearby, as well as castles and caves. Level grounds and easy access, suitable as a stopover campsite (Bis-Toulouse). Hardened motorhome pitches. Vriendelijke ontvagst. Werden voorafgegaan door beheerder in golfkarretje. Afstand van receptie naar plaatsen redelijk ver. Konden zelf plaats uitzoeken. Sanitairgebouw in stervorm, was gedateerd maar schoon. Zwembad was nog niet gereed. The current owners took over this camping in may 2014. They do their best to make you have a pleasant stay and are very helpful. A lot of activities are organized each day: wine- & food tastings, various sports, karaoke, etc. It's a vibrant but quiet and relatively small camping with spacious and shady places. The 'activity-area' (swimmingpool, bar/restaurant, reception and football field) is on one side of the camping, the camping places are on the other. I would definately recommend others to go here! Would you like to book Campsite La Lénotte or request more information? You can do both using the information below or by visiting the campsite's website. Bergerac-Sarlat 7 km east of Le Buisson-de-Cadouin. Follow the D710 at Siorac for 5 km (Bis-Toulouse). Warning! Since July 13 2015, many French campsites are prohibited from installing their own signpost. We advise to use GPS-coordinates to locate the campsite. CampingCard ACSI will send your information request to "Campsite La Lénotte". Take note; you are sending an information request. You cannot make a reservation using this form. You will need to contact the campsite directly and CampingCard ACSI cannot have any influence on the consequences thereof. 1 Information request What do you want to do? In which language would you prefer to receive a reply? Take note; it is possible that the campsite may not be able to comply with this request. I agree to the general Terms and Conditions and the Privacy Statement of ACSI Publishing BV. Your information request has not yet been sent to the campsite. You will first receive an e-mail containing your request which you should check. You will then need to click on the confirmation link in that e-mail to send your information request to the campsite. Our newsletter is full of tips, news, ACSI offers and advertisements from carefully selected partners. You will receive the newsletter no more often than once a week.